Alternatively, students interested in exploring the TCU Bookstore can use the navigation available through the official TCU website to reach their desired destination. This campus bookstore provides a wide range of textbook services for students and faculty. The textbook services are complimented by the wide range of merchandise available for purchase by alumni, faculty, students, staff or the general public both in the brick and mortar store as well as online. The TCU bookstore offers new and used textbooks, as well as etextbooks and textbook rental services to students. These textbooks can be purchased online and delivered to the student via UPS, internet download or can be picked up in the store. Students can determine which textbook type and price works best for them with discounts up to 25 percent for used textbooks, and up to 65 percent for etextbooks. Electronic textbooks can be purchased or rented for a specific period of time from the TCU Bookstore. Thousands of textbooks are currently available in this format and their inventory increases every day. The TCU bookstore also carries a full line of general merchandise to compliment the textbook services. This general merchandise includes TCU merchandise, high quality clothing from Polo Ralph Lauren and Nike, digital and physical school supplies and textbook supplementary material, and essentials for decorating and living in a dorm room. To keep up with the increased use of digital learning technology on the TCU campus, students can also conveniently order a Hewlett Packard notebook, hardware, software and accessories through an online HP ordering service on the TCU bookstore website. In an effort to better serve all of their budget-conscious student shoppers looking for cheap textbooks, the TCU bookstore currently accepts credit cards, a Texas Christian University debit card, or financial aid on specific products available through loan and grant programs as well. Students attending Texas Christian University may also be interested in checking out bookstore competitors in the local area. There are numerous small booksellers and national chains in the general vicinity of the TCU campus. 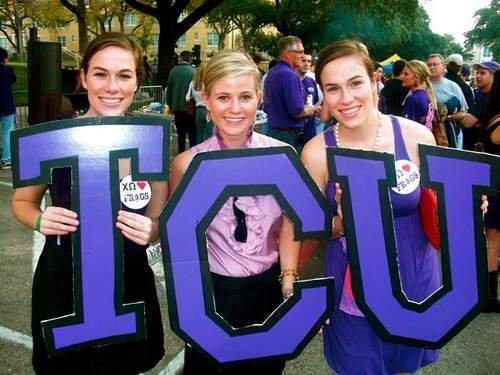 At just about all of these locations TCU students can purchase or sell their textbooks. These local booksellers carry some of the more popular textbook titles, and they can always special order textbooks and books currently not in stock. For more information about the TCU Bookstore, including reviews from TCU students, potential information regarding availability of etextbooks, and driving directions, check out the TCU Bookstore Google Places page.